Both Fnatic and TNC Predator qualified for the Dota 2 Kuala Lumpur Major as the South East Asian teams. 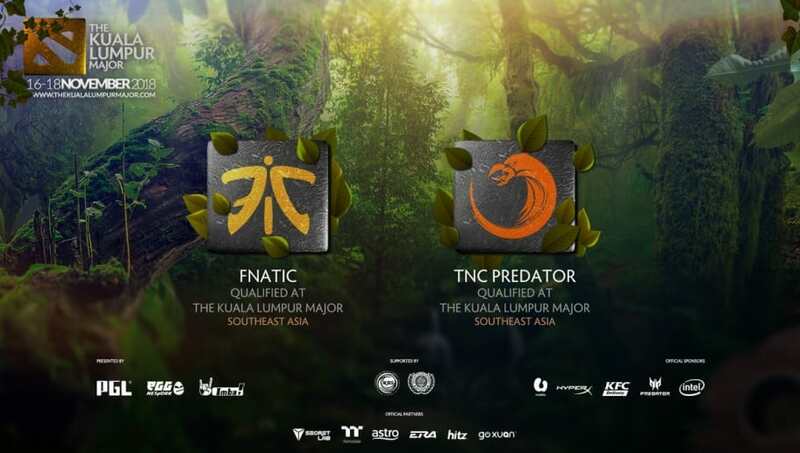 ​​Fnatic and TNC Predator qualified for the Kuala Lumpur Major through SEA qualifiers Friday. TNC Predator made it to the finals and played against Fnatic, but was unable to win. The team later secured its place at the Dota 2​ Major through the lower bracket finals. Both teams comprise the SEA slots at the Major. PSG.LGD, Team Aster, ​and Vici Gaming qualified through the China qualifier, and paiN Gaming and its sister team paiN Gaming X ​qualified through the South America qualifier. The CIS region will be represented by ​Virtus.pro and Ferzee, and the qualified ​European teams consist of Alliance, Team Secret, and Ninjas in Pyjamas. Evil Geniuses, Marchoutofarmy, and Forward Gaming qualified through the ​North America qualifiers. The final team participating at the Major will be determined through the DreamLeague Season 10 finals.